SCROLL DOWN TO READ THE ARTICLE BELOW THE PICTURE! WE HAVE INFO ABOUT WHAT IS ON THE NEW RIC FLAIR DVD THAT CAME OUT ON JULY 8TH. ONE OF THE MORE RARE MATCHES ON THE NEW DVD TOOK PLACE IN WORLD CLASS CHAMPIONSHIP WRESTLING IN AUGUST OF 1982 BETWEEN RIC FLAIR AND A VERY YOUNG KERRY VON ERICH IN A 2 OUT OF 3 FALLS MATCH. THE REASON I SAY THIS IS BECAUSE I HAVE SEEN EVERY MATCH BETWEEN THESE TWO THAT HAVE AIRED ON TV AND OUT OF ALL OF THEM THIS 2 OUT OF 3 FALLS MATCH IS IN MY OPINION THEIR BEST MATCH EVER. MOST PEOPLE REMEMBER THE MATCH THAT TOOK PLACE ON MAY 6TH 1984 AT TEXAS STADIUM WHEN KERRY DEFEATED FLAIR FOR THE WORLD TITLE BUT TRUST ME FLAIR FANS WHEN I TELL YOU THAT THE MATCH THAT IS ON THIS UPCOMING DVD IS A LOT BETTER MATCH THEN THE ONE FROM TEXAS STADIUM. ALL THE INFO BELOW IS WHAT IS ON THE NEW RIC FLAIR:THE DEFINITIVE COLLECTION THREE DISC DVD SET SO GO PICK UP YOUR COPY TODAY......WOOOOOOOOOOOOOOOOOOOOOOOOOOOOOOO!!! 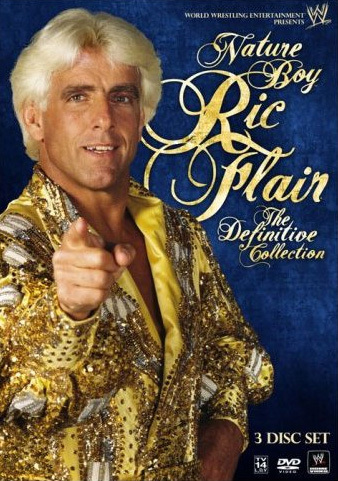 This is a three disc set with a comprehensive professional biography and more than two discs filled with matches spanning the 30+ year career of the `Nature Boy." It's filled with exclusive footage from WrestleMania weekend, as well as the emotional sendoff Ric received at Raw the night after WrestleMania XXIV, including footage that never aired on television. Features several matches that have never before been released on DVD, from Mid-Atlantic, World Class Championship Wrestling, WCW, and more.